rs, sliding glass doors and even on windows, so there’s really no lack of places for a homeowner to utilize retractable screens. As handy and appealing as retractable screens may be, if they are not taken care of, their usability can be short lived. There are many retractable screens built to withstand the wear and tear of daily physical use, but even they buckle without proper care and maintenance. In order to increase the longevity of your retractable screen, homeowners need to practice some handy precautionary tips that will go a long way to keeping their screen in pristine condition. In addition to keeping your screen in mint working condition, it will also help save you money, since the screen you have will be able to last longer and still be durable. 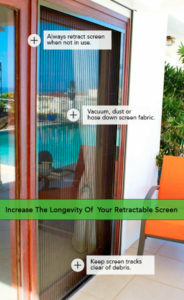 How does one increase the longevity of their retractable screen? Well, let me take you through a crash course on how to do just that. One of the most effective ways to increase the longevity of your retractable screen is to make sure that it is always retracted and tucked away when it is not in use. For instance, if you are using your screen in conjunction with sliding exterior doors, make sure that you retract your screen whenever your doors are closed. With your doors closed, there is no reason to have your screen fully extended. Once it is retracted it will be out of the way and this will reduce the chance of it collecting debris, which will translate to it lasting much longer due to a reduction in its exposure. In most cases, the structure of the door or window frame is suitable enough to guard the screen against exposure to harsh conditions. The tracks are integral to the way retractable screens function. This is why it is important to make sure that the window tracks or door tracks of your retractable screen are always kept clear of obstructions and debris. In most cases, homeowners do not pay attention to the tracks because they do not realize how important they are. Tracks are pretty much tiny crevices for your screen but this also makes these crevices the perfect hiding spot for dust and grime. There are times where other elements find their way into the tracks and if they are not removed in a timely manner they begin to adversely affect your screen and increase the chance of damage. retractable screen. Sometimes the buildup of dirt and grime cannot simply be removed. If your screen track is plagued with dirt and grime, it is best to use a mixture of warm water and a household cleaning solution to wash the tracks. In the instances where this does not work, homeowners can use water and ammonia to get through really tough grime deposits. This will ensure that your track is functioning like it’s brand new and will help increase the longevity of your retractable screen. We have already gone over how important it is to clean the tracks for your retractable screens so it only makes sense that we talk about how necessary it is to make sure that you keep the screen itself free and clear of dirt and dust. Retractable screens are usually made with materials that stand up well against the elements, but as with anything else, over time they begin to wear down. This is inevitable, but as a homeowner, you have a direct impact in determining just how soon your screen begins to wear down. The method you use to clean your screen will depend upon how sturdy the material of your screen is. For screens that are more fragile, it is best to clean them using a dry cleaning spray as to not cause too much friction to the screen. However, if the screen is made of a sturdy material, homeowners can remove the screen and gently wash it and leave it to air dry. Practicing proper screen cleaning is one of the best ways to ensure that your retractable screen lasts for a very long time. This final point should go without saying, but sometimes you might have guests, pets, or children over at your house who do not know the proper way to handle retractable screens. Regardless of whether the screen is on a window or a door, one of the fastest ways for retractable screens to be damaged is by an excessive use of force. This could happen if someone accidentally walks into your screen door, or if someone throws something through it. Homeowners who wish to have their retractable screens standing for a good amount of time have to make sure that they do not subject it to any absurd uses of force. Retractable screens are the perfect compliment and a great asset to any home. They give you the ability to explore the scenery of the outside world while still keeping up a barrier. In addition to this, they come in handy in many other situations, but most of these will be short lived if homeowners to not attempt to keep their screens in pristine condition. I hope the points listed above help homeowners increase the longevity of their screens so that they can get the most out of them. There are some homeowners who express concern about working in retractable screens into their current state of home security because they are not sure if they will be an asset or a liability. If you are unsure about this, make sure you consult with a security professional or a local locksmith who will be able to give you some insight into how to work with your retractable screen or increase its security. Post contributed by Ralph Goodman.